An update to v2.1 is now available: OCEG GRC Capability Model v3.OCEG worked with a committee of hundreds of esteemed experts, including many in-house GRC professionals, external advisors and auditors, and academics, to develop the OCEG Red Book, which contains the GRC Capability Model – the central piece of the OCEG Framework. The Model was reviewed by thousands of individuals during the public exposure and comment periods. The Red Book provides a comprehensive guide for implementing a GRC Capability to drive Principled Performance by governing, managing and assuring performance,risk and compliance. The Red Book includes a short narrative overview and presents the Components of the Model in detail. A spreadsheet version of the Red Book practices is available for download for All Access Pass members. Companion materials include the GRC Technology Solutions Guide, and the GRC Assessment Tools (Burgundy Book) which are also available for All Access Pass members at no cost. The post GRC Capability Model 2.1 (Red Book) appeared first on OCEG. One last step before we send you "GRC Capability Model 2.1 (Red Book)"! 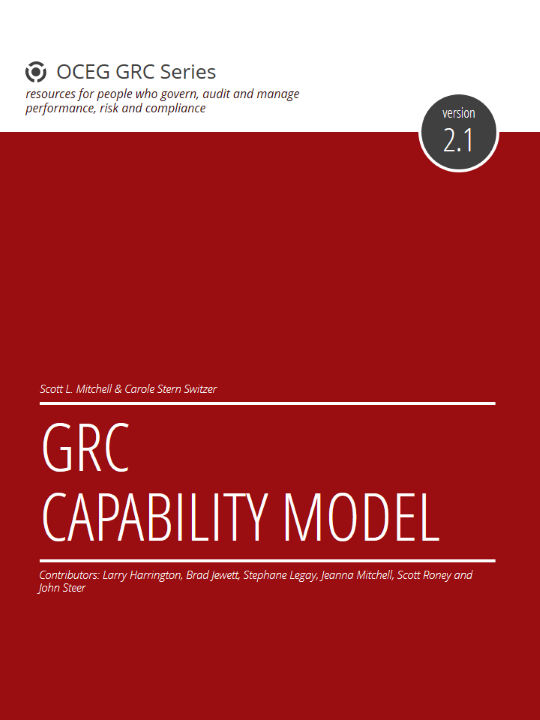 We have emailed instructions to access GRC Capability Model 2.1 (Red Book) to . Make sure the email arrives in your inbox: either add "support@oceg.org" as a safe sender to your email platform, or if you use Gmail, drag our email into your Primary tab.